On Thursday, 31 August 2000, after a good night's sleep, we were up at 6:15. After stuffing ourselves from the many choices at the complimentary breakfast buffet, we checked out of our hotel. At 7:45 we were on board a bus which took us to the Chat Tours office where we switched to our smaller tour bus to begin our "Four Day Classical Greek Tour." Departing about 8:15, we were 10 tourists plus a driver and guide. Our guide, Despina, spoke English well, but we had to listen intently to understand her, partly because of her pronunciation of names of people and places and partly due to the enormous amount of geography and history she could quote. Our first stop was at the bridge over the Canal of Corinth. Though the canal was first considered in ancient Greece and first attempted by Rome's Nero, it is an engineering achievement of the late 19th century. Our tour today next took us to the very ancient ruins of Mycenae. Our first stop was at a burial chamber known as the Treasury of Atreus, poorly named since it was built well after King Atreus and was looted long before modern times. In the immediate area there are several of these burial chambers, the best preserved of which we entered. The size of this tomb is incredible, and the stones are so massive that it's believed that engineers who built Egyptian pyramids must have served as consultants when the Mycenaeans began constructing these "treasuries." Next we walked through the Lion Gate, which is the earliest monument in Europe, to see what's left of the palace of King Agamemnon. It's mostly just piles of rocks which can occasionally be recognized as lower portions of walls. The outer fortifying walls, though, are very large stones and must still look similar to 3500 years ago when they were built. There have been some important artifacts found in Mycenae, mostly from graves, which we saw yesterday at the National Museum. Probably the greatest find displayed in Athens is the gold burial mask known as the Mask of Agamemnon. Leaving Mycenae about 12:30, we went to our hotel in Nauplion (also called Nafplio or Nauplia), the first capital of modern Greece. We found it confusing that places often have multiple names and spellings in Greece. Our only option for lunch was in the hotel restaurant, which was a little more expensive than we had hoped. (It was less than $20, so we shouldn't complain.) We shared a Greek salad from the same bowl as is customary in Greece. Michael had great-tasting roast chicken with potatoes fried in olive oil and Jeannie ate spaghetti carbonara. She noted that the portion served was greater than she and our 18-year-old son Steven could eat. At 3 p.m. we met our group in the hotel lobby and left for Epidaurus. We both kept falling asleep during this 45-minute ride. There are some poorly preserved ruins at Epidaurus, which was the center for worship of Asklepios (or Asclepias), an ancient healer. He was considered a god then and is still honored in modern medicine with his universally recognized symbol of a snake winding up a pole. 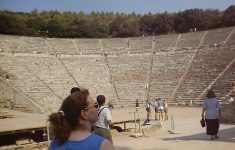 The only places we visited during our one-hour stay in Epidaurus were the museum and the theater. The museum has some good examples of very ancient, small medical instruments found nearby, such as needles, forceps, scalpel blades, retractors, and some objects of less than obvious use. Most of the statues in this museum are merely Plaster of Paris copies of those that were uncovered here. The originals are displayed in the National Museum in Athens. Our tour guide demonstrated, to us and other tourists, the remarkable acoustics in this theater. From anywhere in the seating area, with her standing on the floor, we could hear clearly any sound she made, even her breathing. Before our return to the hotel, we spent a half hour in the tourist section of Nauplion. Then we had a rest time at the hotel until our supper was served at 7:30. Sharing a table, we got a chance to get acquainted with the two young couples in our group. One is from Australia where they are completing their medical residencies. The other couple, married only a year, live in Ohio but hope to move back to the east coast. For supper, which was included in the price of our tour, we had bread, an appetizer, small portions of 4 kinds of meat, fried potatoes, salad with feta cheese, followed with very moist spice cake.